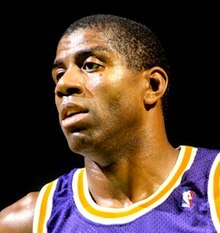 Earvin "Magic" Johnson Jr. BORN August 14, 1959) is a former profesional basketball player. He played with the Los Angeles Lakers in the NBA for all of his 13 seasons and has won five championships. This page was last edited on 13 September 2018, at 14:35.